The 90th Anniversary of Charles Lindbergh's nonstop New York to Paris Flight in the Spirit of St. Louis began today May 20 2017. 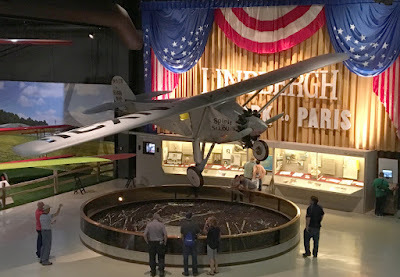 With no sleep in the previous 24 hours, for the next 33 1/2 Lindbergh kept the NYP aloft (even when he fell asleep for a short period) and navigated correctly for the first solo Transatlantic flight. 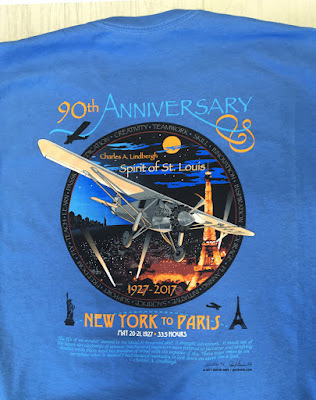 EAA now has Kimberleigh and Paul Gavin's 90th Anniversary Lindbergh flight T shirts available on their web site. 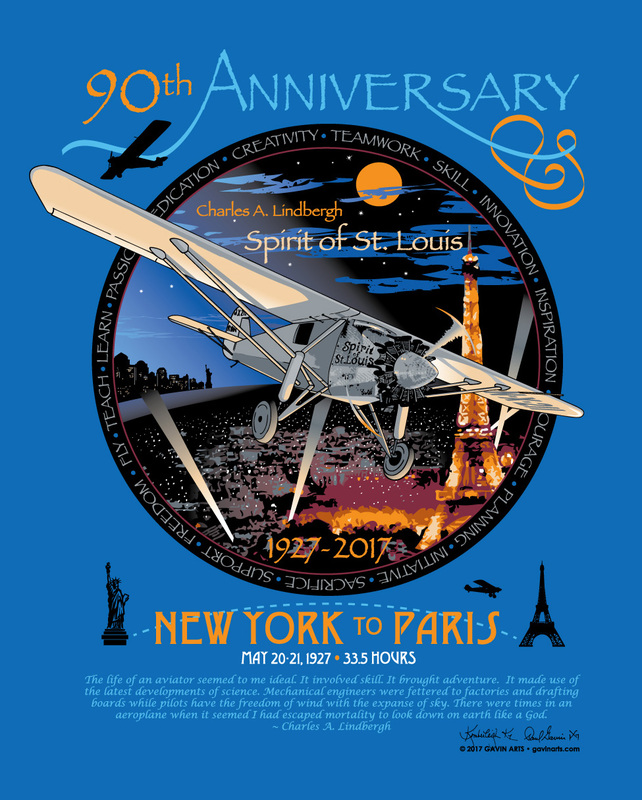 Celebrate aviation, support EAA. Check it out. For more about the Gavins and Gavin Arts go to their site www.gavinarts.com. The Gavins' 90th Anniversary Charles Lindbergh T Shirt is printed and will soon be available for sale through EAA. The piece is finished. Much research went into this project be sure to get it right. Along with photographs of the original aircraft three Spirit of St. Louis Ryan NYP N-X-211 replicas were inspected and photographed to use as models and for other details. 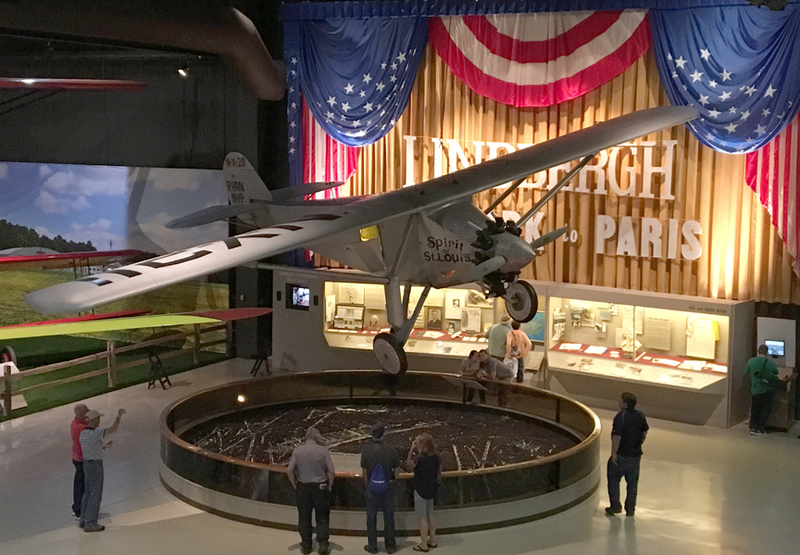 Two of these Spirits are at EAA's Oshkosh AirVenture grounds in Oshkosh, one hanging in the EAA Aviation Museum and the other in the Ryan Aircraft Hangar at EAA's Pioneer Airport. The third is suspended in Terminal 2 Baggage Claim at San Diego's Lindbergh International Airport. All hand drawn by Kimberleigh and paying attention to detail, among other things the Gavins were sure this aircraft had the nine cylinder Wright R-790 Whirlwind engine vs. the seven cylinder Continental R-670 with which two of these flying replicas were fitted. One fun discovery along the way was a photograph found of the NYP taking off at San Diego's Dutch Flats. In the background was a hill where Paul's cousins grew up in a home that was already built at that time. In the distance looms a pine tree he's sure is the one that towered in their front yard. These shirts will soon be available on EAA's web site. If you are interested in one of them email us at Gavin Arts and we will let you know when they are launched! For more information on the Gavins and their work visit our Gavin Arts website.